Focusing on the good stuff. Valencia: from our downtown third floor flat we enjoyed a week of busy urban living. We were less than a mile from the historic city center, less than a mile from the modern art museum, and within temptation’s reach of a multitude of restaurants, coffee shops, and bakeries. By walking just a few blocks from our rental we came to what was once the river Turia. The river has been diverted (a response to a flood in 1957 that inundated 60% of the city, with 60 lives lost) and the river bed has been paved over and made into this 5-mile green space of sports facilities, parks, bike and walking trails, fountains, sculptures, and event spaces. The crown jewel of this oasis is The City of Arts and Sciences. It is a modern architectural complex that totally wowed us. And, while we had wonderful visits to The Silk Exchange, City Market, and IVAM (Institut Valencià d’Art Modern), and a road trip to Sagunda to check out the Roman Castle; the entirety of this blog post will be sharing what we thought was our best day of the stay. Let’s start with the Palace of Arts. It is a 40,000 square meter, 15-story complex – it’s huge! And it’s gorgeous. This performing arts center is home to the city’s opera, a variety of musical ensembles and, with Placido Domingo as a major supporter, a training center for young opera tenors. Front entry with its distinctive plume-shaped arch, affectionately christened by locals as “the feather”, that skims across the steel-plated and ceramic-skinned dome of the building. Close up of the feather flowing over the dome. For good measure, the feather as it tapers to a point at the opposite side of the dome. Standing directly under the feather…just had to include this as it has an other-worldly, almost cartoonish, look to it. We opted for a tour of the facility as we were eager to see how it compared to performance spaces we have worked in. Our guide took us indoors and three flights underground, where we were ushered through a maze of rehearsal spaces and into their smallest performance space – used for experimental theater and as rehearsal space. Next we went up five flights to the main lobby. View from the front of the lobby (that feather tip is now right over our heads). Through the windows we can admire the other buildings and get a sense of how they flow together. Our second performance space with a set just readied for an upcoming Spanish opera. This house is one of four that are connected via a shared backstage area. Each stage backs up against the other, forming an X-shape. Here’s a better visual of how that works: We are standing backstage of one house, looking across at another house, and there is a house on our left and one on our right. The floors are on wheels and can move in and out. Just so you know, this part of our tour was a fortunate serendipity given to us as an unscheduled behind-the-scenes peek. We had told our guide about our interest in the technical aspects of the space and, since it was just Bob and I, she took us back and showed us around. We got to wander a bit and watch the crews at work. A closer view of one of the movable floor units. Another of the adjoining theater houses. On the rear wall of this house was a beautiful mural, “The Dancers”. Back out to the lobby to catch an elevator for the main hall. We could have opted to use the snail of a staircase (which was featured in the George Clooney movie, Tommorowland). Haven’t seen the movie but guess we will add it to our list. Then we will keep our eyes peeled to see if we can actually spot the stairs. This was our view as we walked into The Sala Principal (Main Hall) which seats 1,470 people. As seen from the front of the house. On stage, they were finishing construction on the set for “Rigoletto”. The walls are all finished with ceramic tile, which makes it an acoustic challenge. To address the sound bounce, the architect lined the side walls with curves. The back walls undulate with convex shapes. This is one of those places that screamed for touch. It was allowed. Each seat has built in audio and provides for simultaneous translation. The same manufacturer that makes seats for Ferrari was commissioned to make these. Attention to detail: these are one of the unique door pulls. On the opposite side of the female head there is a male head. Other doors had dancing forms and heads of horned bulls. Our tour over, it was back outdoors to admire the other buildings in the complex. All of the buildings are surrounded by pools with wide interlocking walkways. The walk in front of the Palau features two-sided display boards telling of the accomplishments of women scientists. It is the Palace of Arts and Sciences, after all. 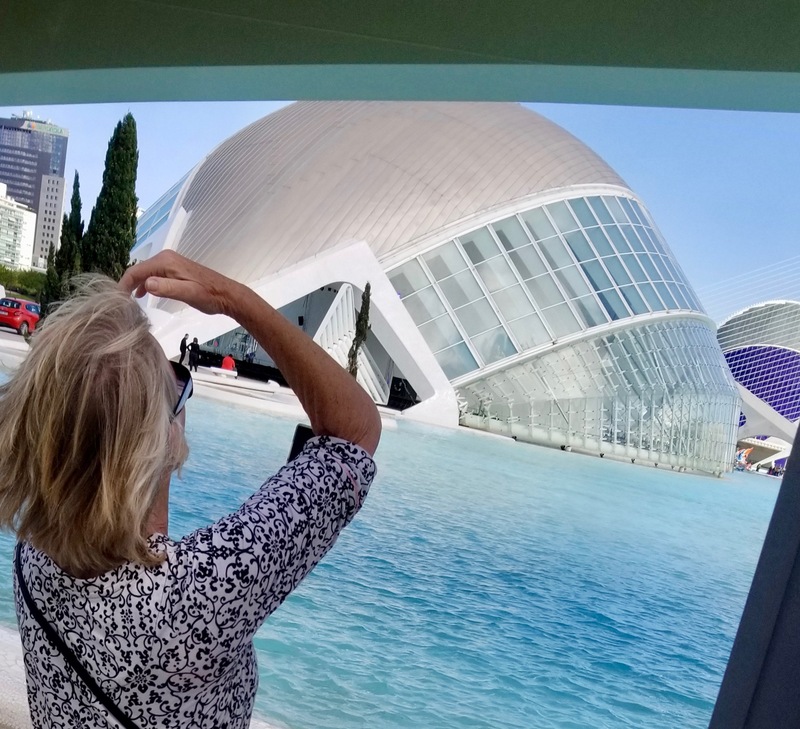 The building next to Palau de Les Arts is the L’Hemisfèric — an IMAX Cinema, planetarium and laserium. The building is meant to resemble a giant eye. Beyond the L’Hemisfèric is El Museu de les Ciències Príncipe — an interactive museum of science that is an architectural take on the skeleton of a whale. Along side the museum are cafes and various sculptures. I especially like this photo as it helps give a sense of scale to the vastness of the buildings. The largest building is L’Oceanogràfic — an oceanographic park. It is the largest aquarium in Europe with 110,000 square meters and 42 million liters of water. It was built in the shape of a water lily and houses 9 distinct aquatic environments. Disclaimer – we knew we had just one day for this outing so we chose to delve into the building that held the most interest for us. The other facilities, though tempting and intriguing, will have to wait for another visit. Maybe a grandson along with us for the sea creatures…??! On top of the parking garage, which runs along side the pools and other major buildings, is L’Umbracle — an open structure enveloping a landscaped walk with plant species indigenous to Valencia. We wandered through as we went back to the restaurant at the Palau for a late afternoon repast of small plates and wine.